Independent Alliance TDs with Galway East's Sean Canney (first, left) and Roscommon-Galway's Michael Fitzmaurice (last, right). 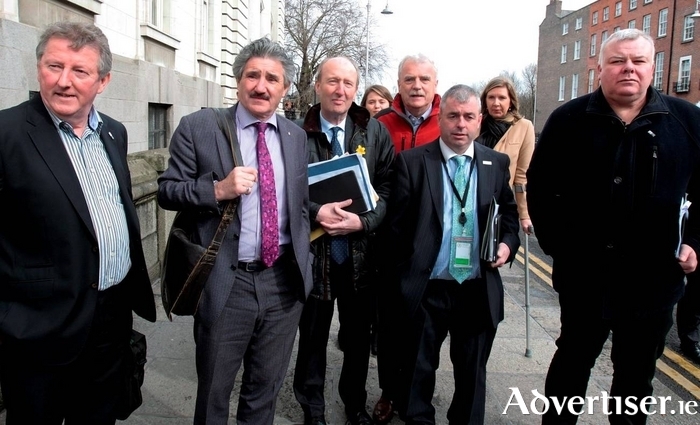 With the formation of a new Government seemingly imminent, following Fianna Fáil’s agreement with Fine Gael to support a minority, FG-led administration, speculation now turns to how many, if any, Galway TDs may be in contention for ministries. No Galway TD has served as a cabinet minister since 2011 or as a junior minister since 2014, in contrast to previous governments where Galway West was often the recipient of a Cabinet and junior ministry, with Galway East also being awarded a junior ministry. Speculation that Galway is in line for at least one junior ministerial post, comes from the fact the Independent groupings Fine Gael are still in talks with, in order to form a minority coalition, are Galway-heavy, and by suggestions that acting Taoiseach Enda Kenny may be willing to give three to five ministerial posts to Independents. Of the three Galway TDs - Galway West’s Seán Kyne and Hildegarde Naughton, and Galway East’s Ciarán Cannon - Dep Kyne is seen as the most likely contender. While it has been mooted that he may make the Cabinet, a junior ministerial office is more likely. An argument for this was that it was noticeable he was given a role in some of the fringe meetings with rural Independents earlier in the process. Against this however, is whether or not Dep Kenny has forgiven the Connemara man for his involvement in the ‘5-a-side’ group of internal critics of Kenny within the party. Fine Gael is currently in talks with the Shane Ross led Independent Alliance and with the looser grouping of TDs around Denis Naughten, dubbed the ‘rural alliance’.The Roscommon-Galway TDs Denis Naughten and former Galway county councillor Michael Fitzmaurice look set to serve as ministers in some shape or form. Dep Naughten is being heavily tipped for the cabinet itself, and provided he signs up to a deal with FG, he almost certainly will serve as a Minister. Dep Fitzmaurice is also being heavily linked with the cabinet, possibly as Agriculture Minister. However, the fact he shares a constituency with Dep Naughten - even though they each belong to a different Independent group - may mean that one of them will have to make do with a junior role. The real dark horse in all of this is Galway East TD Seán Canney, who, despite only being a TD since February, and in contrast to say, Dep Naughton, is playing a noticeably prominent role in the talks. Depending on the number of ministries the Independent Alliance get, he is touted as being in with a chance of a junior ministry. As regards Galway West TD Noel Grealish, he appears unlikely to seek or be given a ministry, despite being involved in the discussions on a new government. According to a number of sources he may not even sign up as a supporter of this minority government, although he is giving the option “strong consideration”. Seán Kyne - the most powerful TD in Galway West? Should the Labour Party be disbanded? Page generated in 0.2023 seconds.